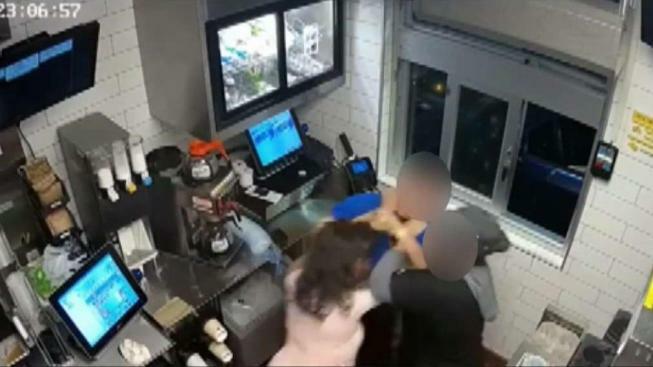 A bizarre brawl broke out in an Orange County McDonald's after a woman went into the employee area, demanded ketchup, and allegedly started choking an employee when she was told to leave, the Santa Ana Police Department said Tuesday. Police were searching Tuesday for the woman captured on McDonald's surveillance footage. It started after the customer, a woman seen in surveillance footage in a pink shirt and gray sweatpants, got upset in the drive-thru because something was left out of her order Oct. 27. She allegedly became so upset that she walked in a back door left open at the Santa Ana McDonald's in the 1500 block North Bristol and began swearing at the manager, police said. The manager said she couldn't believe it started over ketchup. The woman allegedly slipped in through a door left open after an employee took out the trash. On surveillance, the woman in the pink shirt can be seen confronting the manager, and a fight quickly breaks out. It took a while before a co-worker tried to break up the fight. By that point, the woman in pink can be seen on video choking the employee. "It happened all so fast. One of the girls did help me. The rest, I don't know, I wasn't really aware of what was going on," the manager who was attacked said. She didn't wish to be identified. The manager says beyond a few four-letter words, the woman kept asking for ketchup. "We're starting to see more of this type of incident: people upset by service take it beyond a complaint. They physically assault the workers," said Cpl. Anthony Bertagna. About a minute after it began, a man walks in and seems to tell the female attacker it's time to leave. It is unclear if she ever got the ketchup. "Fortunately the male you see got her out of the store otherwise we don't know where this would have gone," Bertagna said. As for the 22-year old manager, she said she suffered more from shock than serious injury. The manager believes the two were seen leaving in a white car.